Oakland, CA—In advance of the release of the World Bank’s 2019 Enabling the Business of Agriculture (EBA) report, the Oakland Institute exposes the Bank’s new scheme to privatize land in the developing world. 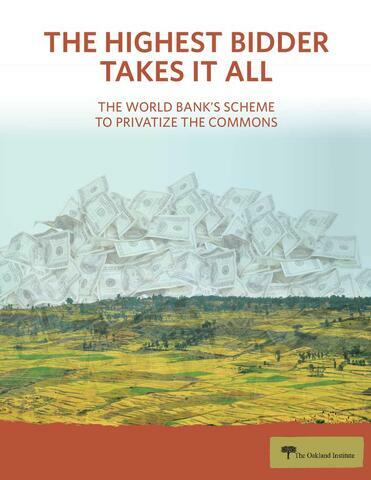 The Highest Bidder Takes It All: The World Bank’s Scheme to Privatize the Commons details how the Bank’s prescribed reforms, via a new land indicator in the Enabling the Business of Agriculture (EBA) project, promotes large-scale land acquisitions and the expansion of agribusinesses in the developing world. This new indicator is now a key element of the larger EBA project, which dictates pro-business reforms that governments should conduct in the agricultural sector. Initiated as a pilot in 38 countries in 2017, the land indicator is expected to be expanded to 80 countries in 2019. The project is funded by the US and UK governments and the Bill and Melinda Gates Foundation. More information on the Our Land Our Business Campaign. Learn more about the World Bank’s ranking programs.